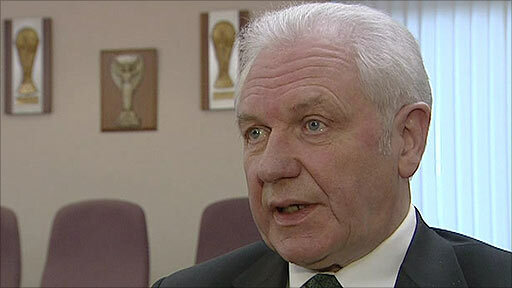 Long-serving Amateur League chairman Jim Shaw has been appointed president of the Irish Football Association. He succeeds Raymond Kennedy who quit after losing a vote of no confidence at the association's ruling council. In a BBC interview, Shaw said the IFA had received some adverse publicity, but that he personally did not think too much change was needed. Government funding for the local game is subject to an independent review into the IFA's governance. Public money had been earmarked for badly-needed improvements for the international stadium at Windsor Park. But sports minister Nelson McCausland insisted the cash would not be released until he was confident that football in Northern Ireland was being run properly. "We have to look at the review as a positive thing," said Shaw. "It is looking at the good, and also that which may need to change. "I imagine it will reassure us that we have a lot of good things going on as well as giving us the chance to change that which may be deemed necessary. "Personally, I would say there is probably not a lot of change needed, but we will find that out when the independent review takes place. "The Irish Football Association has changed over the last 10 years more than anyone could have imagined, and I would guess it is almost there."